She prayed the Independent National Electoral Commission to announce the result of the June 12, 1983 election officially, grant entitlements to the winners, recognise Babagana Kingibe as a former vice president and the executive declare June 12 a public holiday. Mr Kingibe was running mate to Mr Abiola in the June 12, 1993 election. Mr Buhari on Wednesday announced that Mr Abiola would be conferred with Nigeria’s highest national honour, GCFR, while Mr Kingibe would be conferred with the second highest honour, GCON. Enyinnaya Abaribe (Abia-PDP) said he wants President Muhammadu Buhari to declare December 31 as Democracy Destruction Day to mark a coup he championed to end the tenure of a democratically elected government in 1983. “Finally, I want to also propose another day since we are now moving in the right direction, saying that democracy is needed, I want to propose that we also designate 31st December as Democracy destruction day because that was the day that this same president did a coup,” he said. 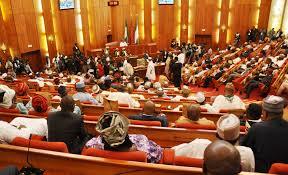 He was, however, shouted down by APC senators who felt his choice of words was offensive. Mr Abaribe was formally cut short by his colleague, Barau Jibrin (Kano-APC), who raised a point of order to call the attention of the Senate to a derailment from issue being discussed. The point of order was sustained. The chamber was taken into another slight rowdiness when Dino Melaye (Kogi-APC) announced that Mr Abiola is not a Nigerian and cannot be granted such honour. He went further to read a section of chapter 43 of the National Honours Act which he believed buttresses his point. Mr Melaye’s interpretation is however novel and not backed by any known judicial interpretation. Mr Melaye also argued that the act provides that such honour be conferred on the recipient in person and since Mr Abiola is dead, he cannot receive the award; a similar claim to that made by a former chief justice of Nigeria, Alfa Belgore. He added that the constitution must be altered to make Mr Buhari’s decision hold. The Senate adopted five prayers including that the result of the June 12, 1993 election must be announced, all allowances and entitlement be paid to Mr Abiola as a former president and Mr Kingibe as a former vice president, Mr Kingibe be recognised as former vice president and that June 12 be declared public holiday. The lawmakers also resolved that May 29 remains the day for inauguration of presidents of Nigeria as June 12 date will mean tenure elongation which is against the constitution. The Senate President, Bukola Saraki, in his comment urged his colleagues to look away from the imperfections and first commend Mr Buhari for the decision. “We need to be guided. I think the whole essence of this discussion was to recognise the fact that Chief MKO Abiola, his contributions, what he had been through, his tribulations. “For many years, it was long overdue. The good intention is what we should recognise. There might be imperfectons in how it was implemented but let us for today take the good intention. “The other issues, I’m not saying they are wrong or right. Whether the award is right, the process, constitutional amendment to recognition of Babagana Kingibe’ position as Vice President, the process of making June 12 a public holiday. “In the spirit of all those imperfections, we should not allow that to cloud what Chief M.K.O Abiola is,” he said.